No matter if you call it T-Hunting [Transmitter], Fox Hunting, Hounds and Hares, Radio Orienteering, Bunny Chasing, Amateur Radio Direction Finding (ARDF), or Radiosport, one thing you are sure to find is that hunting for a hidden transmitter translates into a lot of fun. T-hunting emerged as a school activity in Northern England in the 1950's. By 1961 the activity had spread across the continent and co-mingled with the Scandinavian activity of "orienteering" and the first European Radiosport Championship was held in Stockholm, Sweden. Under the auspices of the International amateur Radio Union the activity has been an international competition ever since. Besides being a hobby/play activity, Radio Direction Finding has a serious side. RDF is used to find downed aircraft Emergency Locator Transmitters, lost persons (hikers, climbers), also useful for tracking down sources of electronic interference. RDF can be used for ground recovery when tracking an APRS balloon. Fox hunting, also known as hidden Transmitter hunting is fun, like going on a treasure hunt or playing hide and seek. 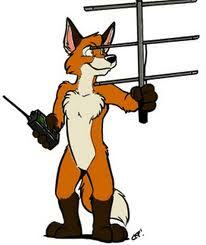 A fox-hunt starts with a transmitter on the 2-meter band that is hidden and is “hunted” or located using radio direction finding techniques. The transmitter is usually on the air intermittently and automatically identifies itself in Morse code. When the transmitter is on the air, the hunters “take bearings” using directional antennas by determining the direction where the signal appears to be the strongest. This is done throughout the hunt until the transmitter is found. The “winner” of a T-hunt is the person who finds the hidden transmitter first. The winner (the hound) is then the person who will hide the transmitter on the next hunt, becoming the fox. The hidden location is usually a good place to hold a 'braai' (BBQ). CQ Worldwide Fox-hunting Weekend (CQ WW FW), 14-15, May 2016. This is the 19th year that CQ Communications has sponsored a fox-hunting weekend. It's not a QSO contest, just a time for clubs, schools and Scout groups to try this exciting radio-sport. There's no license requirement to receive, so everyone can participate. (Keeps the costs down too). On-air competition is a ham radio tradition dating back nearly to the birth of the hobby and fox-hunting has been part of that tradition for at least 60 years. Fox-hunting may be done by car or on foot, and the magazine is encouraging ham groups to use either one or both during the CQ WW FW. Norfolk Island is an external Australian territory in the Pacific Ocean about 1,600km north-east of Sydney. In addition to being one of Australia's most geographically isolated communities, it is also one of Australia's oldest territories. Passports are required to visit Norfolk. Norfolk Island's total population in 2011 (excluding visitors or tourists) was 1796. VK9NT Norfolk Island - A team of Australian radio amateurs will activate Norfolk Island from 20th May until 31 May 2016 to coincide with the Wireless Institute of Australia’s 2016 Annual General Meeting and conference, also being held on Norfolk Island. WIA Commemorative Station VI9ANZAC will also be activated over the AGM weekend. There will be plenty of activity at this DX entity in what is believed to be the biggest Amateur Radio DXpedition of its kind. It is hoped that Mt. Bates will be a SOTA Activation and Jacki Jacki peak on nearby Philip Island. Silent Key Arlene “Buddy” Clay, KL7OT, died on February 11, 2016. She was 103. In 2015 at age 102, "Buddy" was inducted into the Alaska Women's Hall of Fame for her work in rural justice administration among the Yup’ik people. Husband Earl and Arlene Clay came to Alaska after reading an ad in QST - a monthly magazine dedicated to amateur radio - that the CAA was looking for husband-and-wife teams to join the Civil Aeronautics Administration. She was 32 and World War II was raging when they arrived in Alaska in 1944 The couple spent the next decade fishing for food in the summers and travelling the region by sled-dog team in the winter. After Earl's death in 1956, she stayed in their cabin near Aniak and went to work to support herself and the dogs. She drove dogs for 35 years. She was as a magistrate for 18 years, travelling thousands of miles from village to village in the Yukon-Kuskokwim Delta region of Alaska. In 1986 the stove in her cabin exploded and caught her and her house on fire. She had extensive skin grafting, but both her feet had third-degree burns, and as a result she used a wheelchair to get around. She lived in the cabin they built overlooking the Kuskokwim River for 67 years - before health issues forced her to move into the Primrose Retirement Community. Buddy the only Ham radio operator at the Wasilla retirement community, said during an interview: "That's the reason I decided to come to Primrose, because they let me have my radio with me,"
The couples' first Ham radio set was a "Homebrew" rig built on an aluminum cake pan running 10 watts powered by a 1.5-volt dry pack. 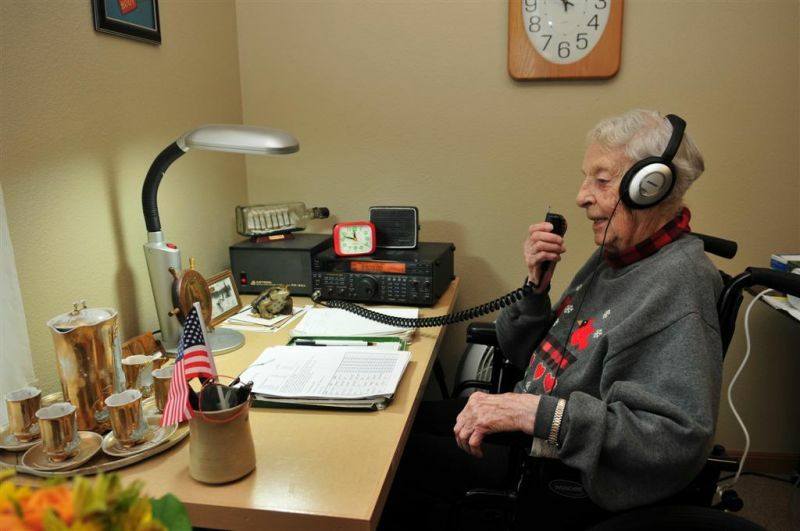 Buddy has been KL7OT since she earned her license in 1948 and began calling the Thursday night 'Snipers Net' for the Matanuska Amateur Radio Association. She called this net each week from her retirement home in Wasilla, it was her voice you would hear taking roll on the Snipers Net. Tom Rutigliano delivered the roster of net members to Buddy each week and helped install the antenna for her Ham radio at Primrose. http://snipersnet.kl7.net/photos.php?gallery=17 Some great pics of Buddy and friends. The Snipersnet has been on the air continuously, every night, seven days a week since February 24, 1973. It now holds the distinction of being the oldest continuous net in the state of Alaska. 6PM local Alaska Time on 3920 kHz. International Morse Code Day is celebrated on the birthday of Samuel Morse (April 27, 1791 – April 2, 1872) who contributed to the invention and the commercial development of the telegraph system and was a co-developer of the Morse code. From “lol” [laugh out loud] to “brb,”[be right back] the internet and text messaging gave rise to a unique form of short form language – “text-speak” – in which almost all of us are well-versed. But long before the internet revolutionized communication, humans experienced a different sort of technological innovation: the telegraph. In 1837, the first commercial telegraphs were released by Samuel Morse, William Fothergill Cooke and Charles Wheatstone, and this machine – as journalist Tom Standage argues in his book The Victorian Internet – mirrored the impact that the internet has had in modern times. The result was an entirely new way to wield language – one that, in a number of ways, resembles today’s text-speak. Using electricity, the telegraph could communicate quickly over long distances – at speeds unheard of. Soon it was developed for both government and commercial use. And because we were suddenly able to transmit interactions over large distances, new types of language were created to fit the medium. One of the forms of communication developed for the telegraph that’s still familiar today is Morse code, which used sequences of dots and dashes (or dits and dahs) to represent letters and numbers. More than just a cipher, Morse code had its own short forms and abbreviations to make messages as concise as possible; in this way, it’s an early predecessor to today’s text-speak. Telegrams were written communications in Morse code sent over a wire (or, later, radio waves) across great distances, which were then translated into written language for the recipients. So as you can imagine – just like with modern character-constrained mediums like Twitter – people developed short forms to get their message across in as little space (and, consequently, for as little money) as possible. Numerous guides to the telegraphic codes were published. Many of these shortenings look familiar even to us today. Take one account from an 1890 New York Times article, which details telegrams sent between two telegraph operators who had never met each other, but had developed their own lingo for their personal messages. You can see a short form “Hw r u ts mng?” which can be parsed as “How are you this morning?” It looks a little bit like a long text message today, or a heavily truncated tweet, from one person to another. Throughout its history, Morse code has undergone its own evolution as different people started to use it for different purposes. In a 2008 talk, historian Jason Scott describes this evolution from the telegraph to amateur radio. Referring to it as the “first social network,” Scott describes how amateur radio operators sent each other messages and updates using codes. They also used this technology to send each other images over the radio using sequences of characters and codes that were intended to be decoded and printed out. These images, sent by slow-scan television methods, which stemmed from similar technology used to send images from space exploration, often included the call signs of their sender and other jargon, and might be an early analogue to online avatars or user profile images. HI HI: LOL of the 19th century? Many of the patterns developed by amateur radio users are familiar to those who use text-speak or online lingo. Ralph Wallio, an amateur radio enthusiast, shared with the author the existence of abbreviations in Morse code, specifically one for laughter. The sequence HI HI, …. .. …. .., is a short form for laughter and is a favourite among amateur radio communicators. It could even be seen as an early predecessor to LOL. HI HI is quite similar to traditional text representations of laughter hehe and haha, which have been in use since the time of Chaucer and Shakespeare. Wallio suggested that using HA HA in Morse code would be read as …. .- …. .-, which would be more time-consuming to transmit, hence the use of HI HI instead. Morse code today has quite a few of these short forms, and some of them will be familiar to those who chat online or send text messages today – not the forms, necessarily, but the things that are being abbreviated. “Thank you,” which is often reduced to “ty” in text messaging and other online communication, appears at “TU” in Morse code. “Please” appears as “PLS” in Morse Code, and “plz” in many forms of communication online. The phonetic reductions of “you” to “u” and “are” to “r” are represented in Morse Code as well. Some of these have withstood the test of time, some haven’t; nonetheless, it goes to show how adaptable language is, and how communication technology almost always breeds new forms of writing. Amateur Radio, the Sky is the limit. HELP – Your input, stories, articles needed! 20-22 May SARL National Convention 2016, hosts Sasolburg Amateur Radio Club. 27 - 29 May WIA (Wireless Institute of Australia) AGM 2016 - Norfolk Island.